The hotly-rumoured BlackBerry L-Series handset has appeared again, showing off its slender frame and large touchscreen. Also known as the BlackBerry London, the smartphone is one half of a flagship duo tasked with launching RIM's revamped mobile platform BlackBerry 10. The images in question popped up on the CrackBerry forums, and apparently show the L-Series smartphone in hand and up against the smaller, yet fatter BlackBerry Bold 9700. RIM has not confirmed which handsets it will be launching at the end of January, although we do know there will be one fully-touchscreen device and one sporting the firm's famous physical keyboard. The L-Series device which appears in these photos and has cropped up in previous leaks, looks very similar to the Dev Alpha B device handed out to thousands of developers to encourage them to build apps for BB10. 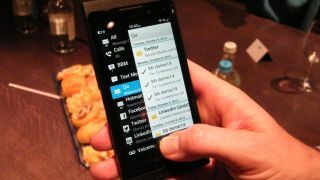 RIM has scheduled an event for January 30 2012 where the Canadian firm will unveil the BlackBerry 10 platform, with handsets expected to go on sale in February.